Both turrets are at the same level of completeness (ready for their rear and top covers). The second turret has clocked up a little under 9000 tool changes. I did have to make a change to the design and fit a 4mm SHCS to the Stepper Motor to Indexer collar instead of the grub screws (Double Grubbed) to stop them coming loose. I would have liked to put another grub screw in the collar, but the stepper motor gearbox shaft has a Flat milled on it and there was no practical place to put one, anyway because the Allen Key for the SHCS is is so much larger you can tighten it up without fear of stripping out the grub socket. 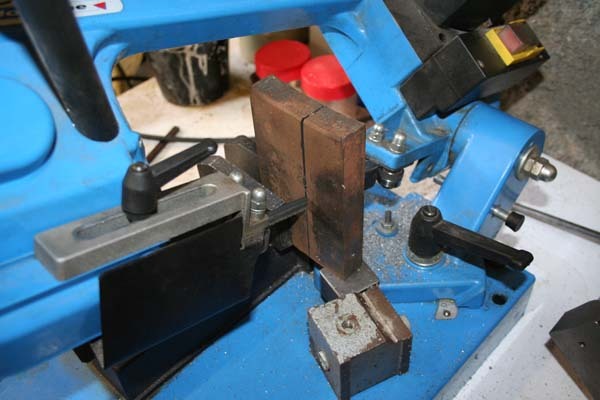 This worked well and has seen many thousands of tool changes now, and has held fast. Along with the indexer came some software enhancements. The turrets can not be presented to the work piece in an non-indexed state (Always synchronised with the present Mach3 running gcode). And checks are done for Miss Indexing (maybe you used the FEED HOLD or STOP buttons in Mach3, released the indexer and turned the turret around by hand in the middle of a job to inspect a tool and forget to set it in it's tool position or perhaps half way between tool stations. This doesn't matter any more as they Auto Index. See video at the 4 minute mark. It look god on picture but couldn't see the video, it keeps buffering forever for some strange reason. To see the first part from 0:00 to 6:48, move the time slider to the leftmost position. Thanks David, your suggestion works. Nice work you did with the changer Dave. Now you need heavy production workload.. I don't what I did differently with this video that I'd done with the others!. I'll try and upload it again when I get some time. Nah, they will never see production work Bubba, when I was searching around for idea's after the brake Idea failed (because I would have to had too large a solenoid to make it work). I went over to a friends engineering works and we spent some time looking at his Indexing and universal Dividing Heads (some of them fit their Cincinnati Number 5) and some small 12 inch one's. It was very interesting, as there was some different methods used to index, and a lot of very fine machining and grinding. or my ability trying to make a true Indexer. which Latches and Unlatches the Indexer. This works so well that, once latched the solenoid alone can not unlatch the mechanism without the motor doing it's little dance. The only time so far that I've used the turret in anything like a production manner was when making the indexer bases in the above pic at the same time I ran the lathe making the Indexer bases 10 off which consisted off 4 tool changes Right hand turning tool to machine 25.4 down to 25 for 300 mm and then the Parting tool used to grove the material down to 10 mm dia at each indexer body length and then left and right hand chamfers on the ends of each cylinder. The lathe ran through and finished unattended while I was baby sitting the mill making the indexer bases because I had to stand at the mill with an extra air gun and help evacuate the chips during the deep spiral milling operations. Of course at this stage the bodies were only half finished and had to be removed from the lathe and cut at the parting lines into cylinders which, were then faced each end and bored and stepped for the spring relief and the bush. So this meant that in the 2 hours it took to machine the 10 indexer bases, the lathe had finished the 10 indexer bodies to the half way stage at the same time by itself (45 minutes) I didn't even look at it until I finished the indexer bases and while not fantastic, in this case it was a definite help. Well I bought the material for the ten turrets, and this turned out to be problem as I had gone through the bill of materials and realised that I could use one dimension of material (110 X 12 mm X 6m) instead of the two widths (130 X 12mm X 6m and 100mm X 12mm X 6m) I had originally used, and so modified my drawing to suit, and last week went to get the material, only to be told that they have lengths as 110 mm X 10 mm X 6M, and that in the dimensions that I wanted , this would be a special order, so I had to re-edit the drawings again for the umpteenth time for 130mm X 12 MM X 6m lengths. The only good to come out of this was, That I learned some new things about setting up the Freecad Drawing properly and using the appropriate constraints for the task at hand. Once I had the correct type of constraints in place (had to edit every sketch) changing the material dimensions was very easy, and the 3D model re-adjusted itself (Bolt Hole Positions,features ect.) moved to the appropriate positions. So what I had now to do was, cut the turret bodies from the 12 (1 m) lengths I'd gotten from the steel supplier. Each end had to cleaned up, as they were cut with a shear (as they were too wide to go into the cold cutting saw they had) . I calculated the length of the cut to be 20.8 metres by 12 mm deep and didn't want to subject my 6 inch or 9 inch grinder to that much work. Didn't really want to use the Abrasive chop saw either as the material was awkward to position. So I marked the cuts out on the first length of material, got the Abrasive cut off saw out, set up the material and pulled the trigger, the saw started up made a horrendous noise and let the smoke out in a big way. This only left me with the old mechanical hacksaw which I'd used maybe two or three times in the last 25 years (mainly because it didn't cut particularly straight or fast) but was good for the times when you needed to cut stock 100 or 150 mm in diameter. What I wanted to do was, cut the ten turret bases fairly close to size and square the whole lot of them up in the shaper at once, so ideally they should be two or three mm over size but fairly consistent. In the first pic you can see that not only, was the cut not square, it' was tapered some as well. in the pulley drive system to get the cut in the second picture. Of course it's still glacially slow though. What I have to do now is continue on with the rest of the bases and then fixture them somehow, so that I can do them in as few set-ups on the shaper to square them up. Continuing on, as far as the coding goes, I thought that I'd finished most of the logic and could tidy up the code and make an installer ect, then I saw this video https://www.youtube.com/watch?v=3NN4NxFI2SY that shows a Mach3 screen set that he wrote for a industrial retrofit of a turret lathe with 6 tool positions, but each tool position could have three tools, this meant that the turret tool slots had to be re-mapped or Aliased for each tool in that particular slot. With these turrets, I did add some holes around the periphery to bolt tooling on, but was thinking that you would replace one tool with another rather than having both at once. And seeing that it was possible to bolt two tools in the same tool slot, I made an Aliasing table so that you can re-map the tool numbers as you wish. This means that for example if you have remapped tool position 1 as 88 then called tool 1 in the Gcode then the turret would move to tool position 1 and apply the offset for tool 1 from the Mach3 tool table and if you call tool 88 then the turret will still move to tool position 1 but apply the tool offset for tool 88 effectively giving you more tools in the turret. I don’t have room for a horizontal bandsaw. However I have variable speed Milwaukee Portaband and a Swag Offroad table for it. A Portaband is great for metal cutting. I get custom very coarse 6 tpi blades made for cutting aluminum. Milwaukee has the highest blade speed in a portable along with constant torque varispeed for hard metals. The secret to cutting dead straight with a Portaband is to pretend you are a lefty and on the other side with your left hand on the trigger. The saw is closer to you and can hold the weight of the saw off the blade with your right hand. I’ve done beautiful miter cuts on 6” channel this way. They had to be nice they were installed as a valance in my bosses kitchen! Have you read my blog? cut into 1 meter lengths with a shear, so about 5 mm on each end of each 1 m length has to be cutoff as it's deformed a bit. I inquired about cutting it up, and the cost of the cutting was more than the cost of the steel. $230 and because of the shear cut ends, I could not get it cut to size which would have defeated the purpose, as I would have to clean up each end of the cut anyway. I went down to our local Tool Store and looked at a "Import" Bandsaw, which was $400 and and could be used as a Horizontal and vertical saw, I liked it a lot but on reading the manual, it's cut width was 30 mm too small. 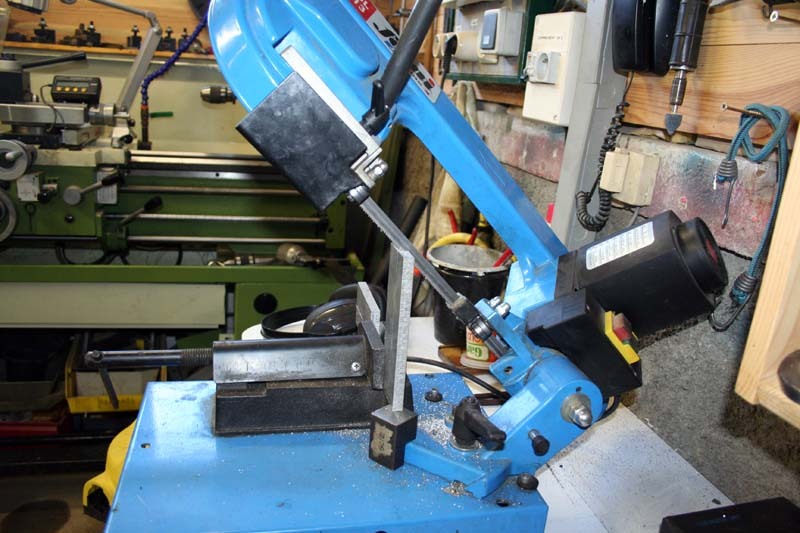 the way to go, although the Bandsaw to cut that width of steel was $650, you got much better machine for that price. 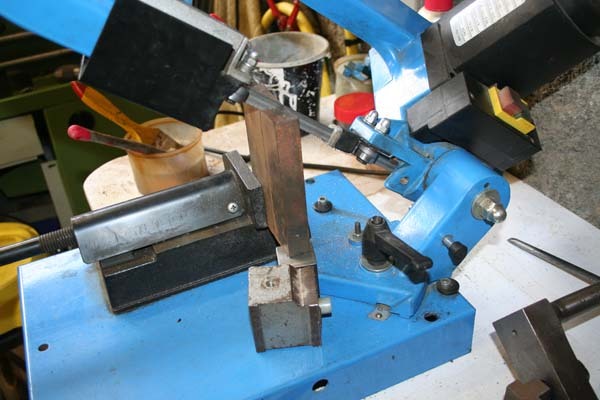 Anyway What I've been doing is setup the Hacksaw and running it, and while it's running, square up the material on the shaper which lets me keep an eye on the saw as it has no auto shutoff yet. I really wanted to cut the 10 Base plates at once then set them up in the shaper in a jig and square them up 10 at a time, but I have to run the saw so squaring them up at the same time makes sense as I'm doing something while waiting for the saw to finish which takes about 15 minutes a cut. I don’t have room for a horizontal bandsaw. However I have variable speed Milwaukee Portaband..
That what I did, needed cut off saw and didn't want to spend money on something that I seldom use. Having Milwaukee Portaband, I made an arm for it adopted cheap Chinese vise and it work just fine. Surprisingly, the cuts are pretty square..
That's not a saw. This is a SAW! Marvel Model 8 tilting head with 18" x 18" throat. We cut lots of 12-3/4" diameter pipe and we have some 16" in the shop as well. You can use the T-slots to clamp a flat slab on the table and it will power feed the blade through it. That's a good idea, I'll keep that in mind Bubba, looks pretty sturdy to me. You've planted an idea here and I'll keep an eye out on the auction sites and if I can find one cheap enough. David, I think your saw looks similar in size to the saw I looked at (the $650 one) although that one looks better made. Wish I had your lathe. I see both of you have your stock orientated vertically, this was my want too, but this little saw won't accommodate this, so I had no choice but to lay the stock at an angle. About 60 deg. Which gives about 40 mm of teeth in the cut. This is not ideal as due to the minimalistic design of the saw, the crank angle relative to blade holder changes from the bottom to the top of the cut, in practice what this means is that at the start of the cut you need a little more pressure on the blade to make it cut properly ( I made a collar that fits onto the front of the blade handle) on the other hand at the bottom of the cut the blade dig in more and some weight would have to be removed. Too try to remedy this, I attached a Parker air cylinder (40mm dia) and a flow control with integrated check valve to the hacksaw arm and filled it with compressor oil, it took ages to bleed properly. I added some weight to the hacksaw arm so now I can get reasonable regulation of the cut by starting the cut and then adjusting the control valve and listening to the sound of the cut. The only problem is that the system bleeds down at about 2/3 of the cut depth, so at about half way through the cut, I stop the saw and re-prime the cylinder by lifting it out of the cut, shutting off the valve and setting the blade down into the cut again and adjusting the valve again. I have to say, that I did the first three turrets mostly with a 6 inch grinder and lots of those ultra thin cuttings disks, which made short work of the job ( I guessing about twice as fast). Page created in 0.168 seconds with 19 queries.